The German battery company will focus on improving its backup system while the market materializes for the cheaper non-backup offering. Sonnen completed its arrival on American shores by opening a factory in Atlanta. 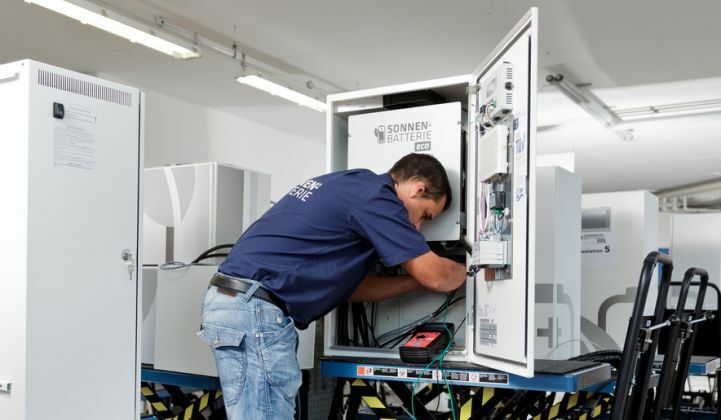 Co-located with the company’s research and development lab, the facility began shipping the second-generation Sonnen Eco battery storage system last week. With 20 months of U.S. sales and a "solid pipeline of orders," Sonnen determined it could save money by moving the systems integration in-house. That decision stands in juxtaposition with the fate of Aquion, which christened a large saltwater battery factory in Pennsylvania before it had a sales pipeline to fully utilize it. That company went bankrupt last month. Sonnen, though, is not commercializing a brand new chemistry, but rather connecting lithium-iron phosphate cells from suppliers with its proprietary housing and software controls. As such, the factory investment poses less of a risk, while eliminating costs associated with contract manufacturing. "The factory will help Sonnen bring its products faster to the market," said Ravi Manghani, energy storage director at GTM Research. "It's important to understand that the facility will carry out integration, and the level of investment is likely lower than needed for battery cell manufacturing." Sonnen now can produce north of 200 units per month, said Olaf Lohr, director of business development, in an interview at the Energy Storage Association conference last week. The company sold close to 600 systems in the U.S. in 2016. One thing the factory won't be doing -- at least not yet -- is producing Sonnen’s cheaper residential model, the Eco Compact. Originally announced last July for release by the end of 2016, this model cut out the backup capabilities of the Eco to focus on the market for solar self-consumption. At the time, it was hailed as a potential competitor with Tesla's Powerwall for cost-effective home storage. It turns out, though, most Sonnen customers want to use their batteries for backup in case of an outage. That's how 90 percent of Sonnen batteries installed in North America were being used, as of September. Meanwhile, Tesla unleashed its Powerwall 2 in October, promising higher energy density and a lower unit cost than its predecessor. The decision to push back the Eco Compact, Lohr said, was partly due to bandwidth -- the team focused its efforts on improving the computing power and ease of commissioning of its Eco product. But the delay also came from reading the market. "The market is focusing right now on backup, but we see more and more of a push for those products that don't require a backup component," Lohr said. Hawaii's self-supply tariff hasn't translated into big battery sales just yet, and California's NEM 2.0 doesn't do a whole lot to improve the economics of storage for solar self-consumption. The strategic location of the factory in Atlanta, though, situates Sonnen in a region that has less favorable policies for home solar, thereby creating opportunities to consume more of that power onsite. Sonnen also is working to create new markets by translating the vision of the German Sonnen Community to an American context. The company is finalizing contracts to install batteries in new-build housing developments, which would make it easier for customers and utilities to get on board. For a customer, the cost of the system would appear as a marginal bump in the mortgage, removing the barriers of cost and financing that often stymie a storage purchase. And the system would already be installed by the time of move-in. Meanwhile, a large housing development could offer a substantial aggregated storage resource to perform utility services, under the right market conditions.